UFO SIGHTINGS DAILY: 100% Proof That Bob Lazar Did Work In Area S4 On One Of Eight Alien Disks, UFO Sighting News. 100% Proof That Bob Lazar Did Work In Area S4 On One Of Eight Alien Disks, UFO Sighting News. Lazar admitted that he worked inside Area S4, a small section of Area 51, and yet he was ridiculed by skeptics. Anyone that doesn't believe Lazar clearly has no grasp on the subject of UFOs at all. He is legit. I looked into back in 2009 and wrote about him in my book UFO Sightings of 2006-2009. I vouch for him. 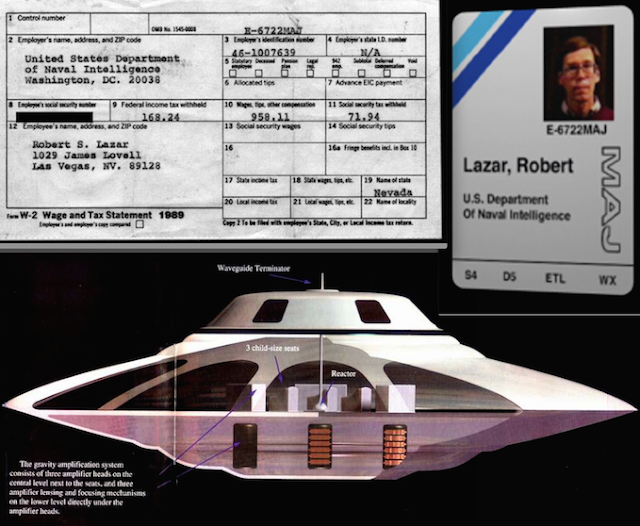 Robert "Bob" Lazar (born January 26, 1959) is a controversial individual who claims qualifications as a scientist and engineer and alleged that he worked with extraterrestrial technology at a site called S4 near the Area 51 test facility. Lazar claimed to have worked in 1988 and 1989 as a physicist at S4 allegedly located at Papoose Lake southwest of top secret Area 51 near Groom Dry Lake, Nevada. According to Lazar, S4 serves as a hidden military location for the study and research of extraterrestrial spacecraft, or flying saucers using reverse engineering. Lazar says he saw nine different extraterrestrial vehicles there and has provided detailed information on the mode of propulsion and other technical details of a disc-shaped vehicle he called the sport model. Lazar's credibility was challenged after it was discovered that "schools he was supposed to have attended had no record of him, while others in the scientific community had no memory of ever meeting him." Lazar's supporters counter that Lazar's credentials and history were sabotaged to create the very questions of credibility his critics have emphasized. Lazar first appeared in the media in the late 1980s. He appeared on television on a local Las Vegas news program discussing his experience at S4 and Area 51. He was also featured in the Los Alamos Monitor in a story dealing with a jet car he claimed to have built with help from a NASA researcher. The car was built from a jet engine modified and placed on an existing car model. The article stated that Lazar was "a physicist at the Los Alamos Meson Physics Facility".